Synthetic peptide within Human alpha Tubulin aa 1-100 (acetyl K40). The exact sequence is proprietary. WB: HeLa, C6 and NIH/3T3 whole cell lysates (treated with 500 ng/ml Trichostatin A for 4 hours); Mouse brain, kidney and spleen lysates; Rat brain and heart lysates; Human fetal heart and fetal kidney lysates. IHC-P: Human and Mouse cerebral cortex tissue; rat cerebellum tissue. IF: HeLa cells treated with 50 ug/ml Trichostatin A for 4 hours. Flow: HeLa cells treated with 500ng/ml Trichostatin A for 4 hours. IP: HeLa treated with 500 ng/ml Trichostatin A for 4 hours. Our Abpromise guarantee covers the use of ab179484 in the following tested applications. WB 1/2000. Detects a band of approximately 52 kDa (predicted molecular weight: 50 kDa). 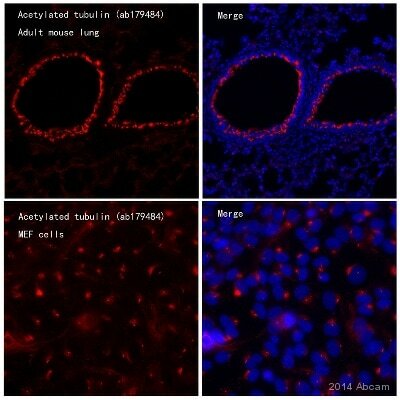 Ab179484 staining alpha Tubulin in HFF-1 (Human skin fibroblast) cell line by ICC/IF (Immunocytochemistry/Immunofluorescence). The cells were fixed with 4% paraformaldehyde and permeabilized with 0.1% TritonX-100. Samples were incubated with primary antibody at 1:20000 dilution. An AlexaFluor®488 Goat anti-Rabbit (ab150077) was used as a secondary antibody at 1:1000 dilution. 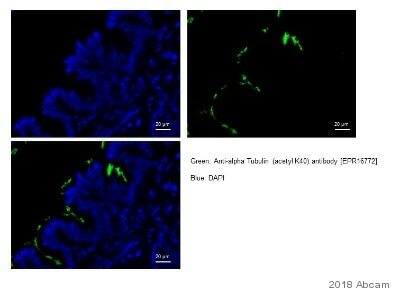 An Anti-Alpha Tubulin antibody [DM1A] - Microtubule Marker (Alexa Fluor® 594), ab195889 was used as a counterstain at 1:200 dilution. DAPI was used as a nuclear counterstain. Confocal image showing cilia (arrows) staining in HFF-1 cells treated with starvation for 48 hours. Ab179484 staining alpha Tubulin in NIH/3T3 (mouse embryonic fibroblast) cell line by ICC/IF (Immunocytochemistry/Immunofluorescence).The cells were fixed with 4% paraformaldehyde and permeabilized with 0.1% TritonX-100. Samples were incubated with primary antibody at 1:20000 dilution. An AlexaFluor®488 Goat anti-Rabbit (ab150077) was used as a secondary antibody at 1:1000 dilution. An Anti-Alpha Tubulin antibody [DM1A] - Microtubule Marker (Alexa Fluor® 594), ab195889 was used as a counterstain at 1:200 dilution. DAPI was used as a nuclear counterstain. Confocal image showing cilia (arrows) staining in NIH/3T3 cells treated with starvation for 48 hours. Ab179484 staining alpha Tubulin in NIH/3T3 (mouse embryonic fibroblast) cell line by ICC/IF (Immunocytochemistry/Immunofluorescence). The cells were fixed with 4% paraformaldehyde and permeabilized with 0.1% TritonX-100. Samples were incubated with primary antibody at 1:20000 dilution. An AlexaFluor®488 Goat anti-Rabbit (ab150077) was used as a secondary antibody at 1:1000 dilution. An Anti-Alpha Tubulin antibody [DM1A] - Microtubule Marker (Alexa Fluor® 594), ab195889 was used as a counterstain at 1:200 dilution. DAPI was used as a nuclear counterstain. Confocal image showing midbody (arrows) staining in NIH/3T3 cells treated with starvation for 48 hours. ab179484 stained in Hela cells. Untreated and Trichostatin A treated (50ug/ml, 4 hours) cells were fixed with 4% paraformaldehyde (10min) at room temperature and incubated with PBS containing 10% goat serum, 0.3 M glycine, 1% BSA and 0.1% triton for 1h at room temperature to permeabilise the cells and block non-specific protein-protein interactions. The cells were then incubated with the antibody ab179484 at 1/500 dilution overnight at +4°C. The secondary antibody was ab150177 used at 1 ug/ml for 1hour at room temperature (colored green). DAPI was used to stain the cell nuclei (colored blue) at a concentration of 1.43µM for 1hour at room temperature. Immunohistochemical analysis of paraffin-embedded Rat cerebellum tissue labeling alpha Tubulin (acetyl K40) with ab179484 at 1/1000 dilution, followed by prediluted HRP Polymer for Rabbit/Mouse IgG. Cytoplasmic staining is observed on Purkinje cells of cerebellum. Counter stained with Hematoxylin. Immunohistochemical analysis of paraffin-embedded Human cerebral cortex tissue labeling alpha Tubulin (acetyl K40) with ab179484 at 1/1000 dilution, followed by prediluted HRP Polymer for Rabbit/Mouse IgG. Cytoplasmic staining is observed on neuron cells of Human brain tissue. Counter stained with Hematoxylin. Immunohistochemical analysis of paraffin-embedded Mouse cerebral cortex tissue labeling alpha Tubulin (acetyl K40) with ab179484 at 1/1000 dilution, followed by prediluted HRP Polymer for Rabbit/Mouse IgG. Cytoplasmic staining is observed on neuron cells of Mouse cerebral cortex tissue. Counter stained with Hematoxylin. Flow cytometric analysis of 2% paraformaldehyde-fixed HeLa (Human epithelial cells from cervix adenocarcinoma) cells treated with 500 ng/ml Trichostatin A for 4 hours labeling alpha Tubulin (acetyl K40) with ab179484 at 1/240 dilution (red line). Goat anti rabbit IgG (FITC) at 1/150 dilution was used as the secondary antibody. ab179484 preincubated with 1mg/ml acetyl Alpha tubulin (acetyl K40) peptide (green) or non-acetyl Alpha tubulin (acetyl K40) peptide (orange). The isotype control was Rabbit monoclonal IgG (black) and the unlabelled contol was cells without incubation with primary antibody and secondary antibody (blue). Alpha Tubulin was immunoprecipitated from 1mg of HeLa cells (Human epithelial cells from cervix adenocarcinoma) treated with 500 ng/ml Trichostatin A for 4 hours with ab179484 at 1/70 dilution. Western blot was performed from 10 µg of the immunoprecipitate using ab179484 at 1/1000 dilution. Anti-Rabbit IgG (HRP), specific to the non-reduced form of IgG, was used as secondary antibody at 1/1500 dilution. Left lane: Hela whole cell extract. Right lane: PBS instead of Hela whole cell extract. Publishing research using ab179484? Please let us know so that we can cite the reference in this datasheet.